Bringing Italy home to Iowa. Our friends and family haven’t been shy about “warning” us that all of our travel will need to cease…or at the very least slow down…once Baby B arrives. Some say it with a chuckle…others much more seriously…but each time, Ryan and I look at each other and think, “Yeah…we’ll figure it out.” Maybe “they” are right. Maybe we won’t want to travel as much. Maybe we won’t be able to afford to travel as much. Maybe it will just be too hard to travel with children…or maybe it will be to hard to travel WITHOUT the kids….I guess that is for us to find out sometime down the road. In the meantime, we are so grateful for the traveling we’ve been able to enjoy…the miles we’ve gotten under our wings…and for all the places we’ve been able to see. While we anticipate our “travel” schedule to be different once the baby arrives, we already look forward to the vacations we will sneak away on as a couple…and others that we will enjoy with Baby B. And when we can’t get away…we will bring some of each of those destinations into our home…and our kitchen! As some of you know, Ryan recently returned from 10 days in Italy. It just KILLED me that I couldn’t travel with him. I mean, come on….of ALL places….ITALY. But, at just over 32/33 weeks…I figured it would be best to stay put in Iowa. 🙂 Lucky for me, Mom came to spend the week with me! When Ryan returned, he surprised me in a couple of ways. First…he brought presents! I honestly was NOT expecting presents. We both travel so much that bringing home “tokens” of a trip fell by the wayside looonnngg ago. But…this time, he had 2 little treats packed away in his bag. First…he pulled out a little Christmas ornament. The ornament was a little red scooter. Adorable! He reminded me that when we were in Italy last year, we had forgotten to pick up a Christmas ornament (our little tradition whenever we travel together) and since there are scooters EVERYWHERE in Italy…he thought it was quite appropriate. I’d have to agree. The second gift was a gift for Baby B. I about cried just at the THOUGHT of him bringing her a present (seriously, these hormones are out of control). 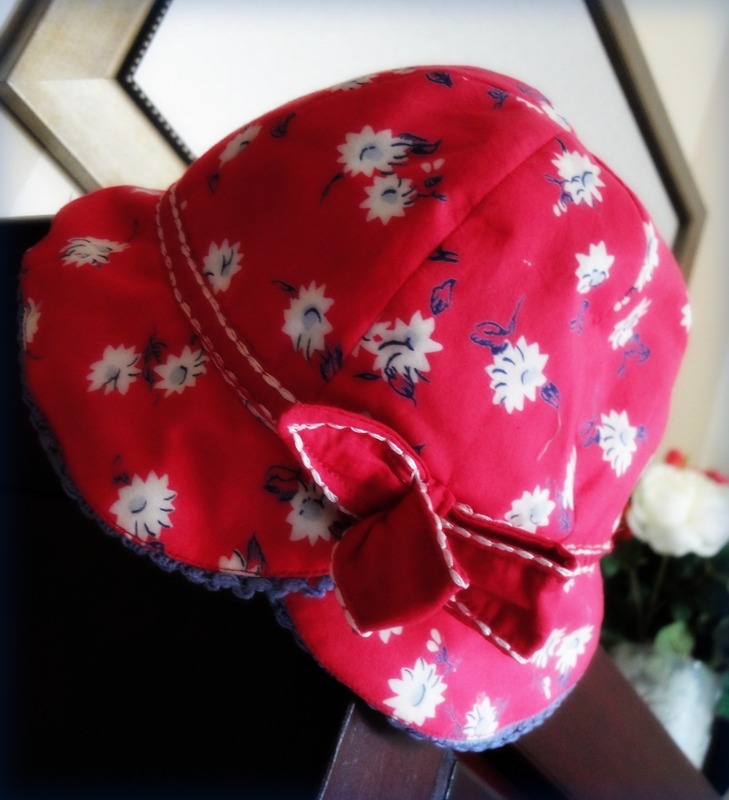 And then…he pulled out the most adorable little hat. I love it! Turns out Ryan walked several miles around Rome trying to find a children’s store…one with the perfect little piece for Baby’s wardrobe. While this picture might not do it justice, I don’t think he could have found a more suitable gift for Baby’s first summer! Thank you, “Dad”, for being so thoughtful and picking out a little something for Baby. 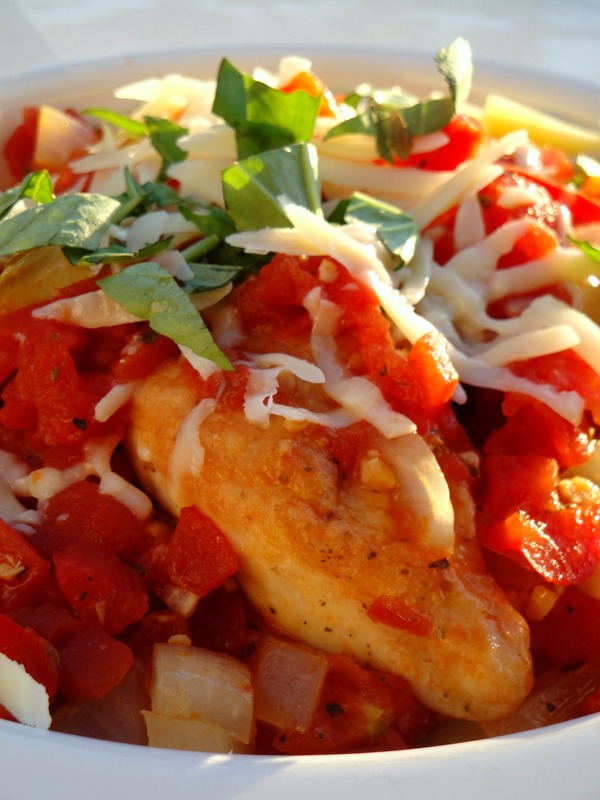 So…that week, I whipped up a batch of Caprese Salad as well as a new recipe, Chicken Cacciatore. The original recipe is by Giada (my fav!) but adjusted to our tastes! We loved this recipe! In a large heavy saute pan, heat the oil over a medium-high flame. Add the chicken pieces to the pan and saute just until brown, about 5 minutes per side. If all the chicken does not fit in the pan, saute it in 2 batches. Transfer the chicken to a plate and set aside. 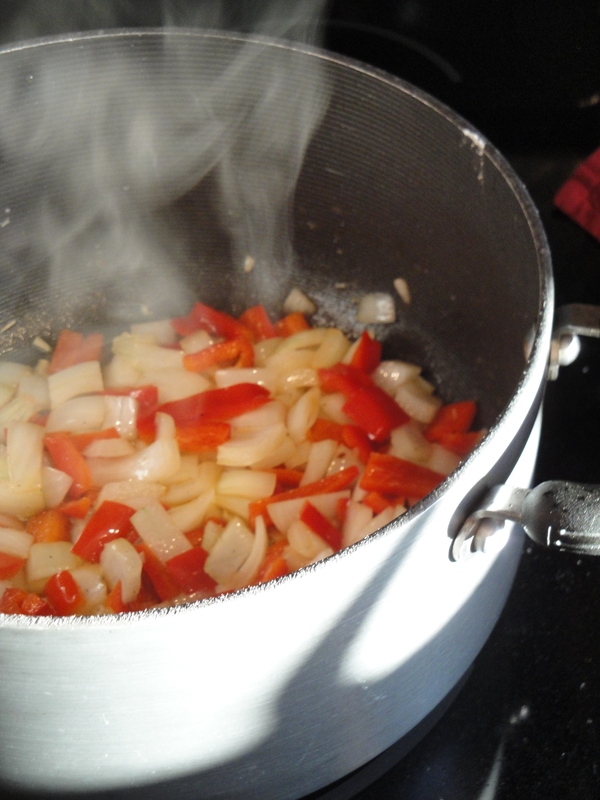 Add the bell pepper, onion and garlic to the same pan and saute over medium heat until the onion is tender, about 5 minutes. Season with salt and pepper. Add the wine and simmer until reduced by half, about 3 minutes. Add the tomatoes with their juice, broth, and oregano. Return the chicken pieces to the pan and turn them to coat in the sauce. Bring the sauce to a simmer. Continue simmering over medium-low heat until the chicken is just cooked through, about 30 minutes for the breast pieces. 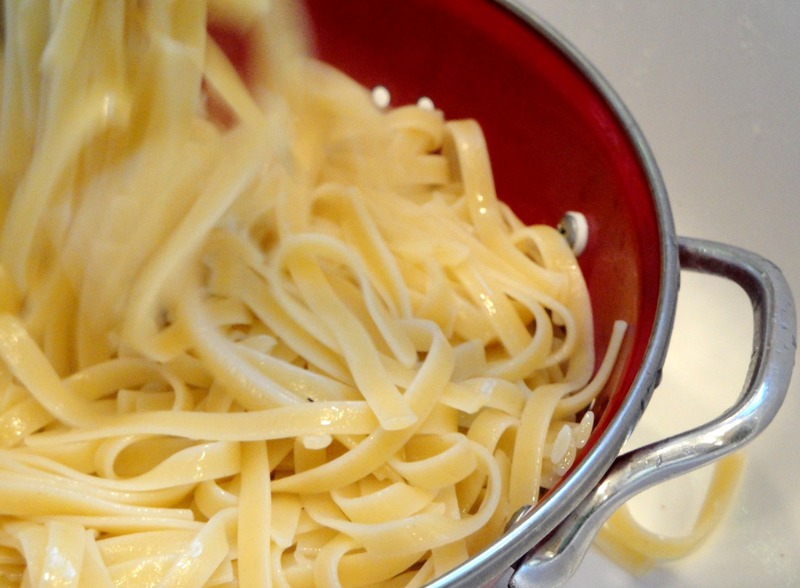 While the chicken and sauce are simmering, boil the fettuccine noodles as indicated on the package. Once boiled to al dente, strain and set aside. Using tongs, transfer the chicken to a platter. 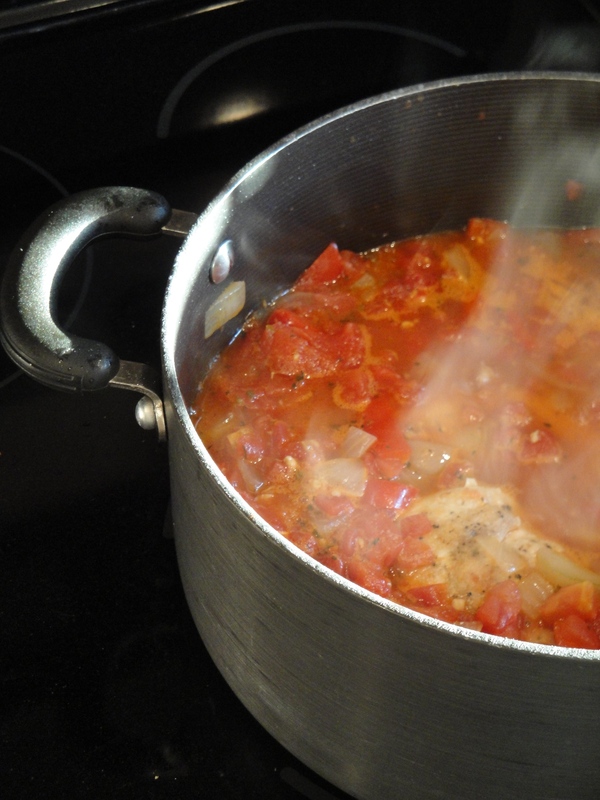 If necessary, boil the sauce until it thickens slightly, about 3 minutes. Spoon off any excess fat from atop the sauce. 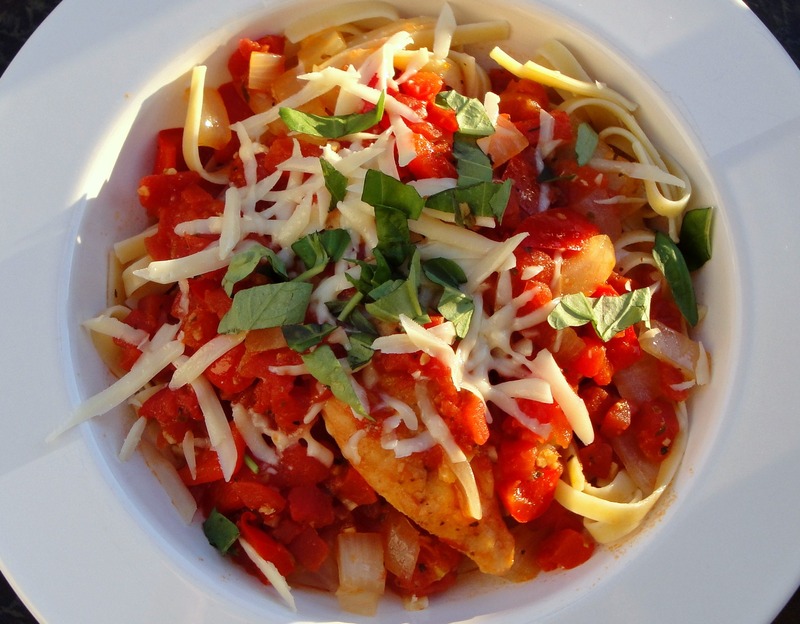 Divide the noodles into single servings, top each plate with a chicken breast and spoon the sauce over the chicken. 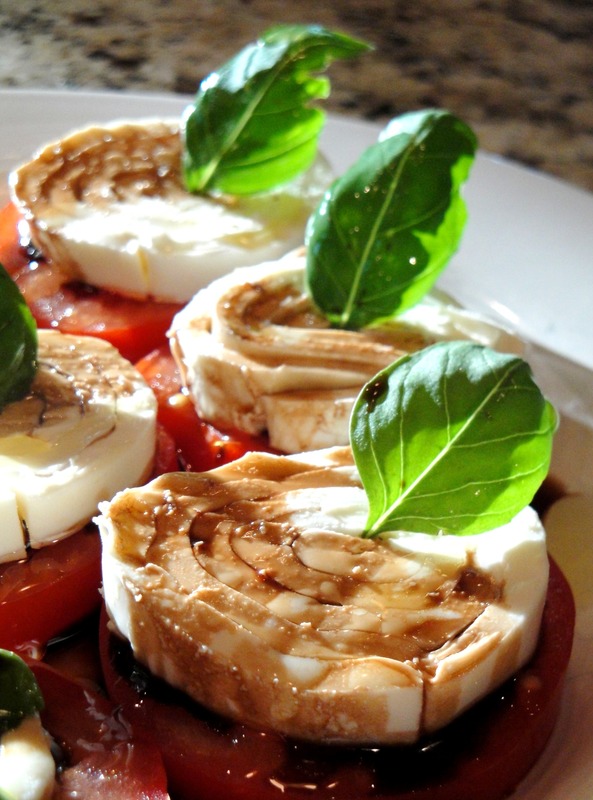 Finally, sprinkle with romano cheese and fresh basil! 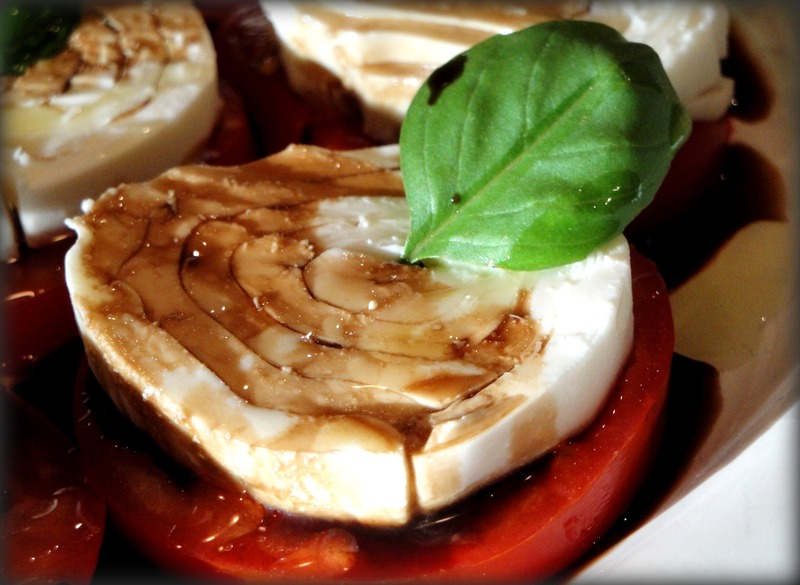 Serve with a chilled glass of Sauvignon Blanc and enjoy a little bit of Italy…in your own kitchen! Aunt Kelly and Uncle Cory will always be up for babysitting so you can travel……or better yet, we can all travel together and have tag-team baby duties – 8 hands are better than 4! We need a phone date soon 🙂 Miss you!